From Thailand, directors Banjoong Pisanthanakum and Parkpoom Wongpoom (Shutter) arrived to present the Montreal premiere of award winning Alone, and – along with co‐directors Paween Purijitpanya & Yongyoot Thongkongtoon (the latter also the producer of Alone) ‐ to assault audiences with the international premiere of 4Bia (which also won the Public Prize for Best Asian film – Bronze). After its successful inaugural edition, Documentaries from the Edge returned with provocative films on films centering around obsession, including cryptozoology docs La Bête du Lac and Not Your Typical Big Foot Film, the disturbing I Think We’re Alone Now, online gaming‐addiction doc Second Skin and New Zealander David Blythe was on hand to present Bound for Pleasure and Transfigured Nights (the latter both North American Premieres). Playback in Horror focused on reality‐horror, including the gore‐soaked Korean film The Butcher (Canadian Premiere), the World Premiere of Home Movie (with director Christopher Denham and producer Andrew van den Houten in person) and the North American premiere of [REC], which kept audiences on the edge of their seats. The audience awarded the film with both Most Innovative Film and Best Occidental film (Silver). Fantasia partnered for the first time with Cinémathèque québécoise to present a spotlight on Johnnie To. Triangle and Mad Detective were two important Montreal premieres but the eagerly awaited The Sparrow – 2 years in the making – was unleashed on Canadian soil for the 1st time. In conjunction with the event, the Cinémathèque québécoise presented an exhibition of rare and striking posters from the collection of TIFF’s Midnight Madness programmer Colin Geddes. Japanese gangster fans received a royal treat with gorgeous vintage 35mm prints from the Nikkatsu vaults in No Borders, No Limits: 1960 Nikkatsu, currated by the New York Asian Film Festival’s Marc Walkow and presented with live English subtitling. The series was presented in conjunction with the book launch for Mark Schilling’s No Borders, No Limits, with FAB Press founder Harvey Fenton on hand. Among the films screened were A Colt is my Passport, VIP Gangster and Velvet Hustler. 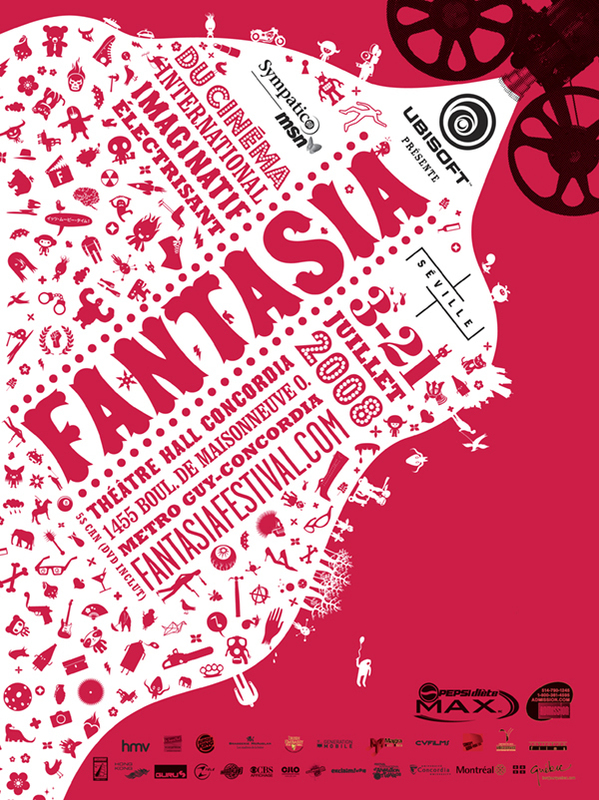 In 2008, Fantasia embarked on the first edition of the now‐staple Fantastique Week‐end du court‐métrage québécois, which included screenings, conferences and events aimed at bringing further recognition to the Quebec film industry. Local feature Who is KK Downey played to an enthusiastic packed house for its Canadian Premiere. The Blood Radical: Unconventional American Horror spotlight featured 8 ambitious American productions, including the World Premiere of Repo! The Genetic Opera hosted by director Darren Lynn Bousman and cast. The audience awarded the film with a much‐deserved Most Innovative Film (Gold), and the film later embarked a successful tour throughout North America. Ryuhei Kitamura presented his first‐ever US debut with the World Premiere of Midnight Meat Train, based on Clive Barker’s beloved short story. Closing out the final Sunday was the World Premiere of Pig Hunt with director James Isaac, co‐producer/co‐screenwriter Robert Mailer Anderson and much of the cast in person (Midnight Meat Train and Pig Hunt tied for the Best Occidental Film‐Bronze prize from the public). Other Premieres included All the Boys Love Mandy Lane, the Canadian premiere of Frank Henenlotter’s Bad Biology (with Henenlotter and producer/co‐writer R.A. Thorburn in person), creepy suicide occult horror From Within (International Premiere)and the Canadian Premiere of Daniel (Blair Witch Project) Myrick’s The Objective. Animation fans were greeted with a handful of distinctive masterworks created by some of the greatest visual artists of this generation. Bill Plympton was on hand for the Canadian premiere of Idiots and Angels (winner of public prize for Best Animated film), while animation omnibus Genius Party dazzled audiences and the Canadian premiere of Peur(s) du Noir offered an atmospheric exploration of the dark. Also featured were the World Premiere of Eric Shapiro’s Rule of Three, hosted by Shapiro, actor/co‐writer Rhoda Jordan and actor Rodney Eastman (the latter most beloved to Fantasians from A Nightmare on Elm Street 3: The Dream Warriors), the Canadian Premieres of Nacho Vigalondo’s Timecrimes and Lucky McKee and Trygve Allister Diesen’s devastating Jack Ketchum adaptation Red, and the Montreal Premieres of Argento’s Mother of Tears (with actress Coralina Cataldi‐Tassoni in person) and the latex‐happy Jack Brooks, Monster Slayer with star/writer/producer Trevor Matthews, producer Patrick White, editor Matt Brulotte and FX artist David Scott in person. And of course what would Fantasia be without its annual showcase of inspired, surreal and sometimes demented short films? Canada was in the house in a big way, with the World Premieres of Jason Eisener’s Treevenge, Rodrigo Gudino and Vincent Marcone’s The Facts in the Case of Mr. Hollow (which won Best Animated Short) and Matt O’Mahoney’s crotch‐crime mini‐masterpiece Electric Fence, while faves from south of the border included Phil Mucci’s Far Out, Damon Packard’s Skatebang, Adam ‘Hatchet’ Green and Ryan ‘Abominable’ Schifrin’s The Tiffany Problem, and a triple‐header of future indie horror stalwart Adam Wingard’s shorts (Paradox Mary, Laura Panic and Don’t Worry – all World Premieres). Overseas contributions included the North American Premiere of Claudio ‘Gobin’ Simonetti’s The Dirt, the Canadian premiere of Kiwi director Paul Campion’s Eel Girl (who is at Fantasia 2011 with his first feature, The Devil’s Rock!) and the Montreal premieres of I Love Sarah Jane (from Spencer Susser, the Aussie director of the magnificent Hesher) and Benni Diez and Marinko Spahic’s manic genre‐ bender Kingz.